Burbank, CA – The Hall of Fame. Words that represent a lifetime of accomplishment. It is the epitome of a person’s journey as they overcame near impossible goals to make their mark in history. Considered as the official Hall of Fame for the martial arts, the Martial Arts History Museum is proud to announce the release the third volume of its Hall of Fame book series which is now available on Amazon.com. The Martial Arts Hall of Fame is bestowed to those select few that have made a major impact throughout their entire career. It is a place where their legacy will be remembered for many generations. 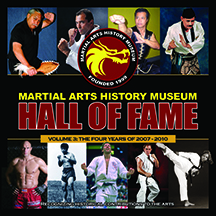 Recognized by the Martial Arts History Museum, the book series honors those unique individuals from all styles, arts and backgrounds who have made a monumental impact on martial arts history. 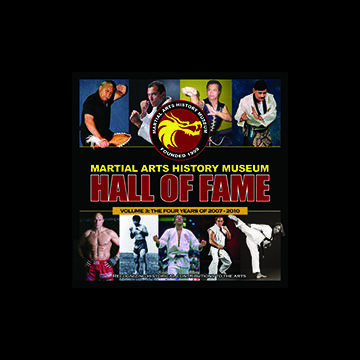 A collector’s item, the Martial Arts History Museum’s Hall of Fame series are the number one best sellers for the museum. It is both a reference book and a documentation of martial arts history. Volume one covered the years 1999-2002, Volume two covered the years 2003-2006 and this Volume covers 2007-2010. Volume 3 features the following martial arts icons, pioneers, champions and legends: 2007 - Emilo Bruno, Yong Sul Choi, Sol Kaihewalu, Shintaro Katsu, Ben Largusa, Arlene Limas, Richard Reed, Mike Swain, Akebono Taro, Senator Richard Alarcon. 2008 - Anthony Chan, Jeff Chan, General Hong Hi Choi, Randy Couture, Linda Denley, Mike Dillard, Maki Mayahara, Hidetaka Nishiyama, Lucia Rijker, Tau Mau Wong, Rafael Kosche. 2009, Angel Cabalas, Rorion Gracie, Joseph Jennings, Taiho Koki, Cung Le, Bow Sim Mark, Bruce Tegner, Karyn Turner, Bruce Tegner, Angi Uezu, Dana White, Akira Kurosawa. 2010 - Jim Arvanitis, William K.S. Chow, Paul DeThouars, Andrew Freund, Dana Hee, John McCarth, Tarao Mori, Remy Presas, Chai Sirisute, Hayashizaki Shigenobu, Ed Parker Jr.
John Corcoran, considered the greatest martial arts historian and writer, wrote the foreward for the book. Michael Matsuda, president of the museum, wrote the contents of Volume three. “So many amazing people sacrificed so much to bring their arts to the world. This book not only keeps that history alive, but shares it with the rest of the world,” adds Matsuda. The museum is a non-profit 501(c)(3) organization and welcomes donations and financial support.